Not wanting to see Bruce destroy himself Alfred took his leave and has been traveling the world. He ends up back in England, and reunites with his ex-fiance, who was cheating on him with his friend. He angrily left the altar and England then, but now he learns that her son Jonny may be his. Meanwhile, Nightwing has followed Alfred here and the two end up caught up in a scheme to take over Great Britain, with a hatred for Europe that makes the Brexit debate look weak in comparison. 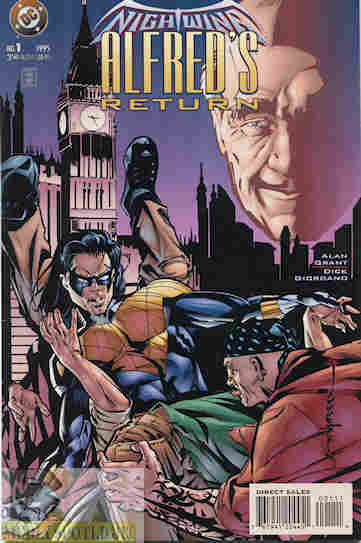 Alfred and Jonny go after the leaders of the coup while Nightwing foils their plan. Jonny ends up dead and his mother admits she lied about Alfred being his father to trick him into helping her son, who was tricked into helping the villains. In the end, hearing that Bruce is back in his right mind, Alfred decides to return to Gotham City. What they got right: It’s nice to see Alfred Pennyworth get some history and development. While Nightwing still wins the day Alfred gets a good showing. The art is also really good. I know, given the art in the 90s, but this is good period. What they got wrong: But part of me wonders what the story would have been like had Alfred been forced to stop the coup without any of the Bat-Family’s help? Recommendation: This is a really good Alfred story with some good Nightwing action added on. It’s worth picking up. Posted by ShadowWing Tronix on December 4, 2017 in DC Spotlight, Yesterday's Comics and tagged Alfred Pennyworth, DC Comics, Nightwing.